There are many times during “Wildlike” where you can easily imagine the version of it that wouldn’t work, either delving too luridly into the sexual abuse that drives its 14-year-old lead MacKenzie (Ella Purnell) away from her only place to stay in Alaska‎ or descending into a series of implausible situations after she goes on the run. But to his great credit, writer/director Frank Hall Green consistently resists making that film, instead showing a restraint and a confidence that would seem to derive from knowing he’s got all the right pieces to put together something special and letting a compelling drama emerge naturally from them. 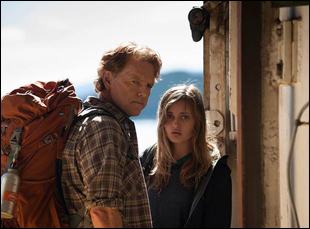 For “Wildlike,” that all starts with Purnell, who gives a poised and delicately modulated performance as the 14-year-old Mackenzie, a young woman shipped off by her unwitting mother from one bad situation to another. Although kept purposefully vague, the recent death of her father ‎has caused a rupture in the family, yet when Mackenzie is picked up at the airport by her uncle (Brian Geraghty), there’s something amiss unrelated to grief, a sense eventually confirmed when he creeps into her bed at night. Stuck in Juneau and discovering her mother is in Seattle, she quietly plots her escape, finding an opportunity when she’s taken out to see a glacier. But “Wildlike” doesn’t pit Mackenzie against the elements at first, showing how surviving on the streets with little cash and no connections in a remote part of the world is difficult enough. When she discovers an unlocked hotel room, she finds more than a place to stay once she realizes it belongs to a widow (Bruce Greenwood) who might be able to help her get to the continental U.S. Setting the film in Alaska was a masterstroke on the part of the filmmakers, adding the majesty of region’s glorious mountainous scenery to what is essentially‎ a small-scale story, but Green cannily employs it for far more. In “Wildlike,” it’s an island of lost souls, full of people just passing through to either find their identity or to have it restored amidst the crisp, cool air. Cinematographer Hilary Spera, who exhibited such skill in pulling character from the West Virginia foothills in the Sean Dunne documentary “Oxyana,” once again works wonders here in capturing the grandeur of the environment while also expressing how physically isolating it can become. A typically elegant score riddled with violent string progressions from Saunder Jurrians and Danny Bensi further enhance the vibe. The inhospitable conditions encourage a reluctant partnership to spring up between Mackenzie and Rene as the latter forges ahead with plans to hike Denali. The stoic Greenwood’s Rene is an ideal foil for Purnell’s Mackenzie, exhibiting sympathy towards her if not an obvious amount of concern, which keeps the film as lively as the occasional run-in with a bear does during their travels. The film also offers a really nice turn from Ann Dowd late in the proceedings as a fellow traveler who helps the two when their car – and by extension, “Wildlike,” as a whole – threatens to run out of gas. ‎However, the journey Mackenzie and Rene embark on together both geographically and emotionally ‎is involving enough that the end destination becomes an afterthought. Green isn’t immune to letting a few familiar plot mechanics ‎sneak their way into the film – police become peripherally involved in searching for Mackenzie and the uncle, a truly chilling figure because of his sense of calm, is able to keep tabs through a phone he’s given her – but by concentrating on the characters, he hits the satisfying beats of a thriller in unfamiliar ways. The more “Wildlike” wears on, it’s clear it is like survival stories you’ve seen before, but not quite. Throw in two engaging performances from its leads‎ and it’s a film worth talking about, especially considering how it’s born out of a topic that so few do discuss. “Wildlike” will be in theaters and on demand on Sept. 25. AFF '14 Interview: Nick Matthews on Seeing Differently with "One-Eyed Girl"